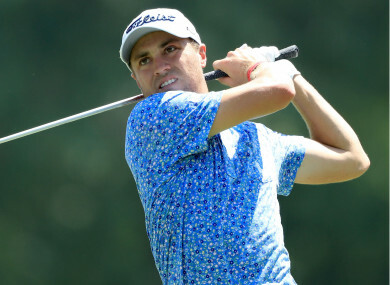 JUSTIN THOMAS AND Ian Poulter led the way at the midpoint of the WGC-Bridgestone Invitational’s third round, as Tiger Woods tumbled down a star-studded leaderboard. Thomas and Poulter had both held a share of first place along with Tommy Fleetwood heading into Saturday. While Fleetwood fell off the pace in round three, the other two overnight leaders were each one under through nine holes to move to 12 under for the tournament. Woods started his third round five strokes back at six under, but appeared lethargic as he bogeyed the seventh and dropped further shots at the 11th and 13th either side of his first birdie. Englishman Poulter, who carded an eight-under 62 to lead after the opening 18, was two under through three on Saturday and briefly pulled clear before dropping a shot at the par-three seventh. Thomas only made four pars before the turn and had two bogeys to go along with a trio of birdies. Fleetwood had been well placed but dropped two shots at the fourth and recorded bogeys at seven and eight to drop to nine under at the halfway stage. Jason Day and Rory McIlroy remained firmly in contention on 10 under as the leaders tackled the back nine. Email “Thomas and Poulter share lead as Tiger fades at Bridgestone”. Feedback on “Thomas and Poulter share lead as Tiger fades at Bridgestone”.